I’m very much looking forward to watching Plaza, an actress I’ve only ever seen in comedy roles play a part that seems to be a lot more dramatic. During Mike & Dave Need Wedding Dates, it didn’t take long before I found myself thinking ‘Oh great, this is one of those types of comedies.’ This unfortunate thought entered my mind within the first ten minutes during the intervention scene. A scene where the immature, co-dependent brothers played by Zac Efron and Adam DeVine respond to their family’s accusation that they ‘rile each other up’. The joke here contained gratuitous use of expletives and was unfortunately over-stretched to the point where I wanted to shout ‘CUT! I promise that I generally do enjoy the effective and creative use of colourful language – just not when it’s over-used to the point where it removes rather than adds to the desired effect, comic or otherwise. There were additional disappointing moments where I thought, ‘Really? That’s how that would happen?’ But I persevered nonetheless. In terms of the good things about director Jake Szymanski’s movie, one of the funniest and most refreshing moments is the dialogue between DeVine and Aubrey Plaza in the scene where they whisper to each other outside their Hawaii hotel rooms. There’s also the rather well-executed massage sequence thanks to an impressive performance by Sugar Lyn Beard and Kumail Nanjiani. Overall, instead of Mike & Dave Need Wedding Dates being the ‘comedy of the summer’ it could have been, what we seem to have is a series of comedy sketches in what ought to have been an improvisation class setting because a lot the jokes / story still needed sharpening and editing down. Last words from me: Seek out the great scenes highlighted above. Otherwise just do whatever makes you happy. For me, Mike & Dave Need Wedding Dates is one more reminder that a truly good comedy is so very hard to make. Why not try Forgetting Sarah Marshall (2008). It’s very special indeed. Dirty Grandpa is a comedy about a lecherous grandfather and his uptight grandson who go on a road trip that one of them really wishes wasn’t happening. Starring Robert De Niro, Zac Efron, Aubrey Plaza and directed by Dan Mazer, this is one of those movies that has a good number of funny moments. The only thing is, those great moments are unfortunately followed by a few ill-advised scenes with dialogue and story development that needed more work/ editing. I enjoyed watching De Niro in the role of an outrageous and expletive filled senior citizen, the opposite of what he did most recently in The Intern (2015) but the writing let him down. As for the other characters, Caricaturish is sadly the word that comes to mind for Julianne Hough’s role as Meredith. I don’t know if my objection is to the type of person she portrays, the way she played her or both. Lenore, (Plaza) is probably the only one that didn’t make me cringe in parts. I’m not quite sure what some might think that suggests about me; hopefully it says that I enjoy language and love to see it used creatively. 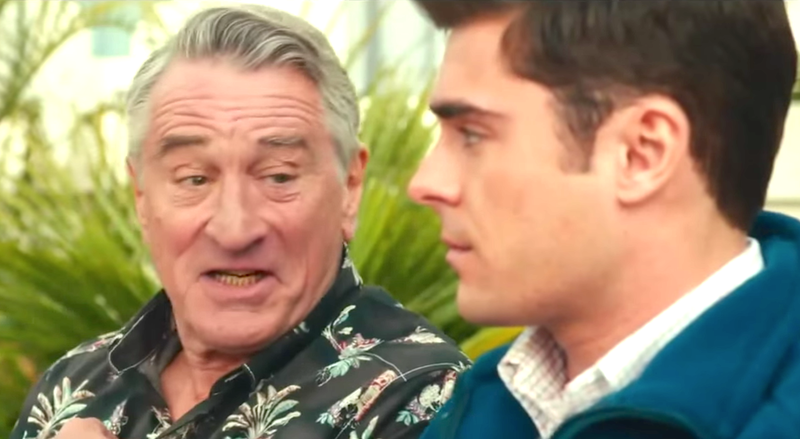 Dirty Grandpa for me, is a story of bonding between a grandson and grandfather. I as though there was no need for the clichéd young romance. But then again, I’m not a teenager, or a Zac Efron fangirl or both. It’s probably fair to say that the actors did the best they could with the material at hand. I certainly wouldn’t tell someone looking for a really great comedy to make time for Dirty Grandpa. But, if you’re a big fan of at least one of the actors, even I know that I can’t stop you. Mike & Dave Need Wedding Dates looks like the kind of non-serious summer viewing fun I’m going to be in the mood for come July and August. Zac Efron is lovely and all, but it’s really Anna Kendrick playing an outrageous character that I’m most looking forward to in this movie. For some reason I still think of her as the prim and proper young professional, Natalie Keener – George Clooney’s side-kick in Up In The Air (2009).